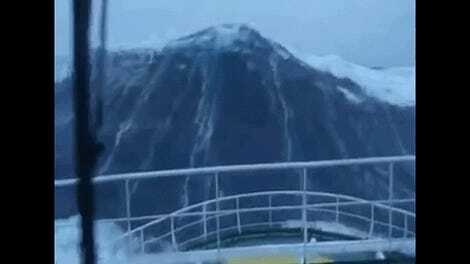 On New Year’s Day, 1995, an instrument off the coast of Norway measured a rogue wave 84 feet high. Now, scientists are recreating these waves—albeit in miniature—in the lab. The researchers were able to create a wave with equal steepness to the Draupner wave, occurring in a similar out-of-the-blue scenario, using a round tank whose 168 wave makers can send waves in any direction. Typically, waves are limited to some height, after which they break, and the tip collapses over the rest of the waves. 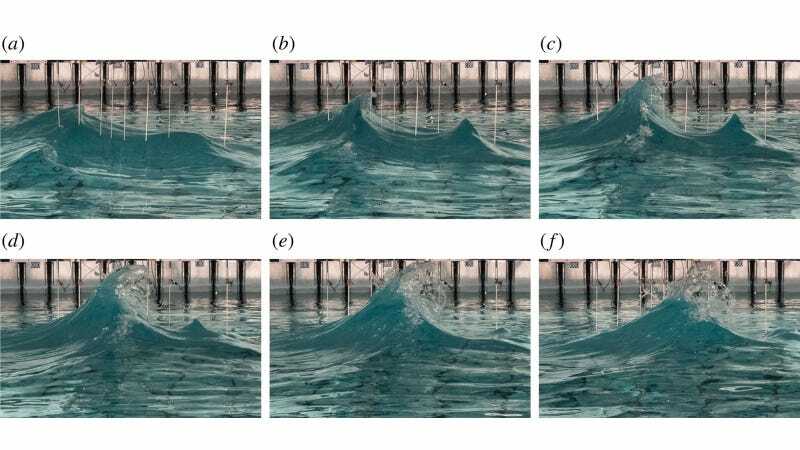 But the researchers noticed sets of waves crossing at 60 to 120 degree angles could cancel out the horizontal movement of the water— the “breaking” behavior of a wave instead sent water upward like a jet. Everyone else says this looks like the famous Hokusai “Great Wave” painting, presumably because a press release said so. I mean, they’re both waves, I guess. But the painting represents a real ocean wave, and the photo captures a small wave created in a tank in a lab—and that important distinction is the main limitation of the study. Ocean waves like the Draupner wave or the Hokusai wave occurred out in the real world, influenced by countless variables, and are hard to simplify into easy mathematical equations or lab experiments. The formation mechanism behind “freak waves” is likely more complex than a lab experiment alone will reveal. And indeed, the researchers point out in their paper that the Draupner measurements should be taken with a grain of sea salt, since they come with a level of experimental uncertainty.